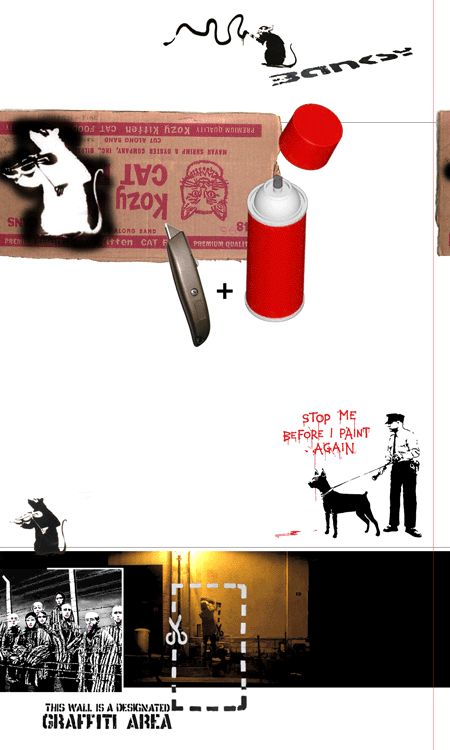 The Banksy manifesto is talking about how the application of paint can make a difference. He use an extract from the diary of one of the first british soldiers to liberate of nazi death camp Bergen-Belsen in 1945. "I can give no adequate description of the Horror Camp in wich my men and myself were to spend the next month of our lives. It was just a barren wilderness, as bare as a chicken run. Corpses lay everywhere, some in huge piles, sometimes the lay singly or in pairs where they had fallen... A very large quantity of lipstick arrived. This was not at all what we men wanted, we were screaming for hundrerds and thousands of other things and I don't know who asked for lipstick. I wish so much that I could discover who did it, it was the action of genious, sheer unadulterated brilliance. I believe nothing did more for those internees than the lipstick. Women lay in bed with no sheets and no nightie but with scarlet red lips, you saw them wandering about with nothing but a blanket over their shoulders, but with scarlet red lips. I saw a woman dead on the post mortem table and clutched in her hand was a piece of lipstick. At least someone had done something to make them individuals again, they were someone, no longer merely the number tatooed on the arm. At last they could take an interest in their appearance. That lipstick started to give them back their humanity." >from *from banksy manifesto*. > banksy graffiti , south bank london. "Painting a picture in a public space to make people think or smile is criminal damage. Flogging your product via TV, radio, billboards, spam email, adverts in urinals, 'free' gifts for kids, peer pressure et all is known as marketing. Banksy understands this." > art crimes. the writing on the wall. "In many places, painting graffiti is illegal. We do not advocate breaking the law, but we think art belongs in public spaces and that more legal walls should be made available for this fascinating art form. Because it is so hard to get books published and to keep photos and blackbooks from being seized and destroyed, the Internet may be the best way to publish and preserve this information." > wooster collective : a celebration of street art.